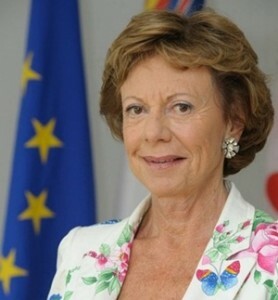 Neelie Kroes, Vice-President of the European Commission responsible for the Digital Agenda, has stressed the importance of wireless in helping the European Union achieve its Digital Agenda targets for broadband access and outlined initiatives to boost the European consumer, Single Market, and mobile industry innovation. She suggested that industry had the confidence to invest: and the incentives to innovate, and while across Europe, huge sums had already been poured into next generation mobile technology, it was not yet keeping up with the pace set elsewhere, such as the USA, Asia and Latin America. “The Digital Agenda has set out some very clear targets on broadband access: wireless helps deliver them. Already, wireless solutions are essential for getting basic broadband to those in rural areas where wired is not an option. But beyond that, I want every European to have 30 Megabit coverage by 2020: and that’s where next generation wireless networks will play a very important role. Already today, in some places, 4G offers those speeds—if not higher,” she advised. “But I also want at least half of Europeans to have ultra-fast access at over 100 Megabits by 2020: again, it is clear that no single technology will deliver this, no single magic potion will get us there overnight. We rather need an intelligent mix of complementary technologies, deployed incrementally, and according to local circumstances,” she suggested. Kroes stressed the importance of removing any constraints on the surging wireless economy, and avoiding a spectrum crunch, noting the release of the ‘digital dividend’ 800 Megahertz band for wireless broadband. “And we will take this success further. Under the EU’s just-agreed radio spectrum policy programme, a European spectrum inventory will identify at least 1200 Megahertz of harmonised spectrum for wireless broadband by 2015,” she declared. “As it stands, we have not – yet – identified where that extra spectrum will come from. But, as you know, discussions on the possible allocation or co-allocation of the 700 Megahertz band for mobile broadband have already started in the past weeks in Geneva,” she advised. Other initiatives included “novel” ways to share spectrum, and the greater integration of fixed and wireless networks. “All in all, through our coordinated spectrum policy and enhanced competition in the roaming market, we can deliver a boost to the European consumer, a boost to our Single Market, and a boost to mobile industry innovation,” she stated, suggesting that Europe would then be well placed to compete in the global mobile marketplace, and to repeat the “remarkable” success of the last ten years.